I don't think I'll end up with graphics as nice as this video of nanotechnology. rule #3 says that an object can move if another object can move. And that object too may be subject to this rule, leading to an entire chain of dependencies that have to be solved. That is not a problem if you process turns for the free spaces instead of the objects. This is a classic problem in roguelike games, btw. here. Repeat for all neighbours. That minigame looks like a really fun project, congratulations! Have a terminator piece/end/receiver that cannot take any pieces, if you try to put a piece there it results in an immediate pile up. So a blank 10x10 tile warehouse has 100 terminators (That are invisible/look like a floor piece) and everything you build replaces a terminator. Chris, that's an interesting idea. I had been thinking of adding a “capacity” field for each tile, to enable a “shelf” tile that lets you stack up goods. A tile with capacity of 0 would be a good default to put on each space at the beginning of the game. I grew up in a family company that built custom conveyors. 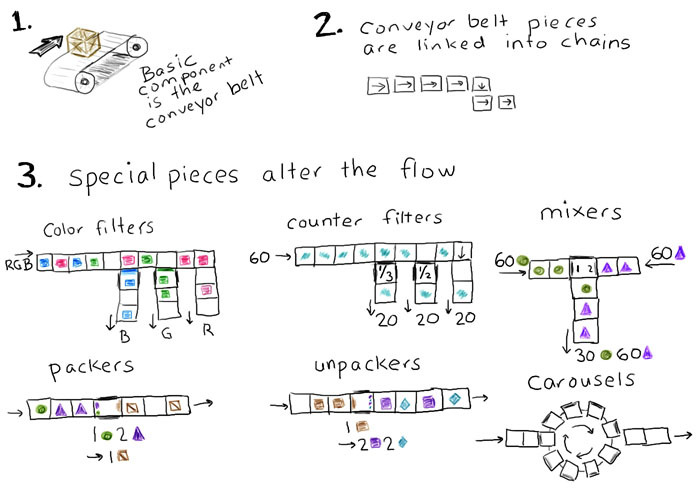 I worked there for almost 20 year and I never thought about a game with conveyors. In the 90ies I used to play a game on the mac called 'factory' or something similar, it was kind of what you described. Quite fun too. This video and this video might also help explain why I'm so interested in this topic. Manufactoria is a Flash game that features puzzle solving using using conveyor belts and color filters (my terminology). They have a series of colors instead of a single color, and you can both remove colors and add colors to the list with the pieces you place, and probably other things in the levels I haven't gotten to yet. It's a neat game. I'd love to donate towards a project of yours! Big fan of you and your brother's work. Best of luck! Hi Erik, thanks! Right now I'm not working on any game projects but I hope to next year.